Tag line: "BLISTERING SUN...BLAZING BULLETS!" Five years before he redefined the American Western with Stagecoach, John Ford directed this World War One-era adventure about a British patrol pinned down by snipers in the Mesopotamian desert. The trouble starts when the patrol’s commanding officer (Neville Clark) is shot dead while riding across the barren terrain. His second-in-command, the Sergeant (Victor McLaglen), takes control, and, while leading his men to rejoin their brigade, stumbles upon a desert oasis, where they find plenty of water. With no idea where they are or how far away their brigade is, the Sergeant decides that he and the 11 men in his patrol will spend the night at the oasis, then make a fresh start of it the following day. But when the platoon awakens the next morning, they find their sentry dead and their horses missing. Thus begins a desperate stand-off as, one-by-one, the men in the Sergeant’s patrol are shot by Arab snipers hiding behind the nearby dunes. With their numbers dwindling and their options limited, the Sergeant and his troops, including Sanders (Boris Karloff) and Morelli (Wallace Ford), search for a way out of what appears to be a hopeless predicament. While Victor McLaglen makes for a strong lead, convincingly portraying a man doing his best to deal with a dangerous situation, many of the other performances in The Lost Patrol come up short. Surprisingly, one of the worst is delivered by Boris Karloff, who never seems comfortable in the role of Sanders, a religious zealot who, believing he and the others are doomed, takes it upon himself to save his comrades’ souls. Still, in spite of its sub-par acting, The Lost Patrol managed to pull me in to its story, building up plenty of tension as the men attempt to outwit an enemy they can’t see (but who can clearly see them, firing off shots each and every time a member of the patrol is out in the open). The fact that the Arab shooters remain concealed throughout the film only heightens the suspense, putting the audience as much on edge as the Sergeant and his men, who have no idea where the enemy is hiding, or even how many of them are out there watching. The year after he made The Lost Patrol, John Ford won the first of his four Academy Awards for 1935’s The Informer (another movie starring Victor McLaglen). 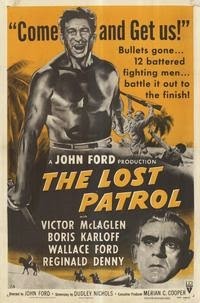 And while The Lost Patrol may be a “minor” john Ford picture, it’s an entertaining diversion nonetheless, featuring a fair share of nail-biting moments and more than one surprise.